Whilst visiting London in April I desperately wanted to eat at Petrus (a modern French cuisine in Knightsbridge, part of the Gordon Ramsay group) but I had left it too late and there were no tables free, luckily Gordon has another restaurant in the same building The Boxwood Café that had room for me. The reason for this was because the place is HUGE! How they manage to keep the food at such a high standard doing such volume I have no idea. Restaurant Gordon Ramsay in Chelsea has maybe 15 – 20 tables at most, it’s small, elegant and intimate. Boxwood is the opposite; it’s big, informal and has a bar. I was a little unsure at first, as it was a totally different atmosphere than I was used to. Luckily once the food arrived I forgot all about it, as it was just stunning! 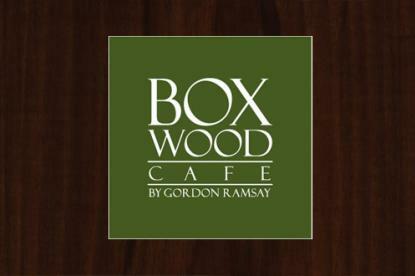 I went for the 6-course ‘Taste Of Boxwood’ sampling menu, as I wanted to try as much as possible. It consisted of..
Chili, lime and coriander are ingredients I’ve had with salmon and crab many times, grapefruit is not. I’m so glad I did, the combination of these flavours was unbelievable. Again this is a really interesting combination of flavours that tastes amazing. I would never have considered orange and pear with beetroot but they were balanced so well it was perfect. I’m a massive fan of tuna. The black pepper sauce was immense and the quails egg complimented it very well. This was the course I was looking forward to the most and I wasn’t disappointed. The beef was soft, tender and moist and the mash was the creamiest, smoothest I’ve ever had and the parmesan was genius. I love Crème Brulee! I don’t really love Tia Maria but this was great, thanks Gordon! I’m not a big dessert lover. This was interesting if not amazing, the melted chocolate came in a large pot with a candle underneath it keep it hot. The chocolate was stunning, rich and dark and the marshmallow was not like any I had ever tasted before. It’s not something I would rush to order again but I’m glad I have tried it. Boxwood offer a selection of wines by the glass chosen to compliment each course. Some of the highlights were Akarua Pinot Noir ‘The Gullies’, Central Otago 2006 with the tuna and particularly Bouvet-Ladubay, demi-sec, sparkling red NV with the dessert. I had never tried a sparkling red before but I certainly will be doing in future! Overall, I had a fantastic night at Boxwood, although it is big and informal the quality of food and level of service was just as good as the 3 starred restaurant. I would definitely recommend it for anybody wanting to try fine dining without spending the cost of a new car. It’s the only Gordon Ramsay restaurant without a dress code which is good if you don’t feel comfortable going out to eat in a suit and it’s amazing value for money compared to the others. The six courses at Boxwood (7 including the complimentary Brulee!) 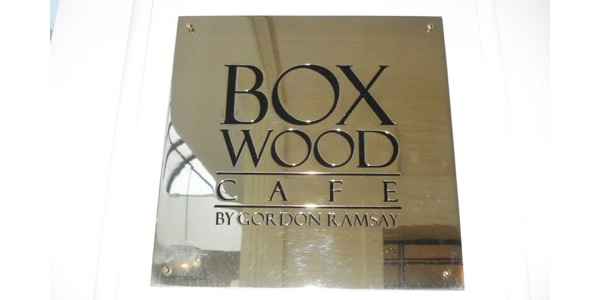 cost just £55 (wine not included), at Restaurant Gordon Ramsay in Chelsea a 3 course meal costs £90.